Initial necklaces are very versatile so create your own! You may choose to string your own initials; spell out a name or affirmation; choose the first initial of each of your kids’ names and add a birthstone for each; spell out your sorority name; or give a Braille hug and kiss with "XO" hand stamped in Braille. The options are endless, get creative! Each sterling silver disc comes with one initial (or Braille cell). Please preview the charms and birthstones which can be added for a special touch. Speak to Me Catalog: http://www.speaktomecatalog.com is a great source for talking gifts. They have talking and audible products for people of all ages. Their product links are arranged in alphabetical order to facilitate navigation, and the site provides links to audio clips of many of their products. Among their many categories you will find talking cookie jars and stuffed animals, singing key chains, audible luggage locators, talking measuring tape and scales, clocks, and hand-held electronics. Another on-line source for gifts is the Parents & Friends Association of the California School for the Blind (PFA-CSB): http://www.pfa-csb.org/holiday.htm. It contains links to a variety of businesses that carry toys, games, and other fun items for visually impaired kids. Some of these items include computer CD-ROMs, movies, music, and talking globes. The American Printing House for the Blind: http://www.aph.org is one of the largest producers of materials for visually impaired people. They offer a wide variety of special aids, tools, and supplies that are useful at home, at work, or at school. Some of their products include: 4-track tape recorders, Talking computer software, and educational games. In addition, they carry a line of "Special Touch" gifts. Among these you can find T-shirts with the braille alphabet, sweatshirts, braille key chains, and greeting cards. Independent Living Aids: http://www.independentliving.com is a company that carries products for people with disabilities. In their selection of products you will find nice gift items for those who like games or sports. They have a "Game Balls" category that lists all kinds of audible balls. They also have a variety of board games like Monopoly, Chess, Scrabble, Battleship, Chinese Checkers, Backgammon and different card games. While you are in their Web site, you may also want to check out the "Children's Talking Games" and "Crafts" categories. Abilitations: http://www.abilitations.com is a company that offers products for children with special needs. Many of their products focus on sensory stimulation, movement, positioning, exercise, aquatics and play. Among their products you will find: Therapy Balls, Movement Scarves, Saddle Floats and Tactile Stepping-Stones. Blind Treasures: http://www.blindtreasures.com is a unique business. It is mainly an Email-based service. Users may subscribe (free of charge) to an Email newsletter, called The Treasure Scroll. This newsletter provides information about new products, which are often one-of-a-kind. If a member likes a product, they may email their request. If the requested item is still available and in stock, payment arrangements can be easily made. After getting a hat and a T-shirt, what about braille jewelry? These personalized pendants by Kim Christiansen have become one of the most popular items to hit the braille jewelry market since Christiansen Designs created the world's first line of braille jewelry some 17 years ago. This handsome sterling silver pendant can be embossed with a person's name or a meaningful word, up to 7 cells. The pendant is 3/4" wide, and 1" to 1-3/4" high, depending on the number of braille cells needed for the word you select (the braille reads downward from the point where it attaches to the chain; to read it properly, you would hold the pendant horizontally in your left hand at the end where the chain attaches, and with your right hand read the braille from left to right). All pendants come with a beautiful 16 inch or 18 inch sterling silver snake chain - your choice. For yourself or as a gift for another, these lovely pieces will long be remembered. Click this link to order or see a picture of a pendant: http://www.nbp.org/ic/nbp/PBP001.html. BlindBargains.com tells us about The Crazy Frog TShirts Ebay store which features several custom-made items with braille messages. You can order various-sized shirts and teddy bears, and choose to have the braille raised (for the blind) or flat (for sighted readers). We are unsure as to the accuracy of the braille on these items. Click this link to visit The Crazy Frog TShirts Ebay store. Finally, if you prefer something sweet and tasteful you may want to try the Chocolate Experience: http://members. tripod.com/~Chocolates/textcatalog.html. They manufacture all kinds of chocolate novelties such as braille chocolate bars and chocolate guide dogs. They also have braille cards and gift baskets. Bitty Braille is a hip and trendy children's t-shirt line that will make you "see" things a little differently. The fashion forward tees for infants and toddlers featuring simple words in Braille are not only cute but give back to a good cause. 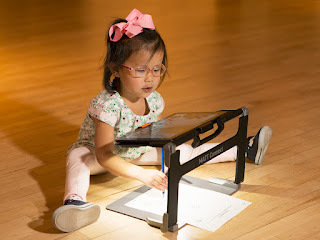 Independent designer, Julie Dutt, of julie*ann handmade goods, is proud to introduce http://www.bittybraille.com, an expansion on her popular Braille product line that targets a smaller audience, those of the infant and toddler size. Inspired by the success of her Braille pendants and charms, the new tee collection features simple Braille words on stylish 100% cotton tees. These unique t-shirts are adorned with simple "kid-friendly" words like cutie, laugh, smile and darling, set in Braille using swarovski crystals for the girls and metal studs for the boys. The translation is hand embroidered beneath. You can also get them personalized with your child's name. Bitty Braille tees come in a variety of colors and sizes from 3/6 months to size 4T. They are sweatshop free, made in the USA of 100% cotton and incredibly soft. Each design is handcrafted by the company's owner/designer, Julie Dutt. Another product offered is a luscious modern baby blanket made with soft, fine-wale ivory corduroy paired with a plush pastel dot fabric. To add more to this textural feast for baby, a soft polar fleece panel features babies' first initial in Braille made using blanket-stitched felt dots. The lovey size of 17" square is perfect for toting around everywhere and sure to be babies favorite blanket. How about fun hair clips for girls? Sturdy metal clips are covered in rich grosgrain ribbon and feature a first initial in Braille on a pearly white flower. The clips coordinate perfectly with all the Bitty Braille tees for girls and come in olive, sky, pale pink and chocolate. Bitty Braille products make more than just a fashion statement. A portion of the proceeds will be donated to the American Foundation for the Blind (http://www.afb.org). The tees will come with an information card about AFB and a short history of Braille. Everyone likes giving and receiving jewelry, especially unique, handmade, and custom-designed items. You don't have to be blind or have low vision to appreciate the beauty of these unusual, finely crafted, and fun braille pieces^DDLthey're perfect for anyone on your holiday gift list. Click this link to visit the At First Sight website at http://braillejewelry.blogspot.com. Click this link to visit Christiansen Designs at http://christiansendesigns.com. Wearable, fun embroidered clothing, including T-shirts, tote bags, hats, and bibs, created by Deb Kersey-Tagoe and her daughter Bronwen Tagoe. Phrases include "Blind People Do It In the Dark," "Braille Is Beautiful," "Dots Talk," "Cane or Canine: That Is the Question," and "Oy Vey." Prices range from $8.50 to $29.00. >Click this link to visit Braille-A-Wear at http://www.braille-a-wear.com. Hand-crafted men's, women's, and children's braille T-shirts use genuine Swarovski® crystals or metallic studs as braille dots. Standard grade two contracted braille phrases include "Brailliant," "Braille is cool," "Can you see me now?" "Can't touch this," and "Feel the love." Also available in grade one braille. Prices range from $12.95 to $29.95. Click this link to visit http://www.Brailletshirts.com. Create your own custom-designed braille T-shirt or hoodie. Choose your word or phrase (a maximum of 10 characters) and then select your T-shirt or hoodie style and color. Prices range from £16.50 to £34.50. Click this link to visit Primitive State T-Shirts in the UK at http://www.primitivestate.com. Chocolate braille plaques embossed with "Merry Christmas" and "Happy Holidays." $10.95 each. When you order, you may choose milk, dark or white chocolate Each piece is presented in a box with a see-thru lid. Click this link to visit The Chocolate Vault. STEP BACK IN TIME WITH A RADIO, TURNTABLE, CD PLAYER OR JUKEBOX FROM FUN-RADIOS.COM! Browse the Online Store to see the great selection of Desktop and Traveler Radios, Console and Tabletop Turntables, Music Boxes and more! These are fabulous replicas of the early days of radio, crafted with attention to every detail, built using the finest materials and featuring the latest in audio technology. Fun Radios aren't just your average gift idea - they're fun AND functional too! Click this link to visit http://www.fun-radios.com. Search this Online Lamp Shop for the brightest ideas in lighting - from whimsical kids' lamps, fun novelty lamps, to elegant and themed decorator lamps. Looking for a special lamp for a theme room? Know someone who collects frogs, elephants or Elvis memorabilia? they have hundreds of lamps in hundreds of shapes, sizes, colors and designs. Fun Lamps aren't just your average gift idea - they're fun AND functional too! Click this link to visit http://www.fun-lamps.com. Why settle for an average clock when you can keep time with a Fun Clock from Fun-Clocks.com? Browse the Online Clock Shop for whimsical novelty and collectible clocks or classy decorator clocks. Looking for a special clock for a theme room? Know someone who collects frogs, sunflowers or Marilyn Monroe memorabilia? they have hundreds of clocks in all shapes, sizes, colors and designs. Fun Clocks aren't just your average gift idea - they're fun AND functional too! Click this link to visit http://www.fun-clocks.com. Why settle for an average phone when you can talk to your friends with a Fun phone from CustomPhones.com? Browse the Online Shop for whimsical novelty and collectible phones or classy decorator phones. Looking for a special phone for a theme room? Know someone who collects frogs, sunflowers or sports memorabilia? they have over one thousand phones in all shapes, sizes, colors and designs. Fun phones aren't just your average gift idea - they're fun AND functional too! Click this link to visit http://www.customphones.com. The Wardrobe Wanderer's Shoppe is another resource for braille greeting cards. Click this link to see their blog post with samples of what they offer. Bay Area Digital is a registered agent for Royal National Institute for Blind Persons and carries their product line, making it much easier for US customers to buy their products, some of which are quite interesting. You can get the catalog by clicking this link: http://rnibcatalog.blinkweb.com. All the businesses mentioned above have made a great effort to make their sites accessible to blind and visually impaired individuals. This should help to make your shopping experience "a piece of cake".